Threshold Brewing & Blending is one of the newest breweries in the Portland area, and it was our last stop of the day. The sixth brewery we visited -- and, honestly, my memory of it is not very strong. Sorry…. And I promise to revisit the next time I’m in town. This brewery is just now getting under way. They had five taps of their own beer and four guest beers. I had a sample of Fuzz Face, a New England IPA. The day was long, fun, full of good beer from six breweries. Thanks to the guys for a great experience, especially R. for organizing it and A. for deftly navigating the Portland traffic to get us from place to place. Another Zwickelmania in the books. See you next year. Once again, I happened to be in Portland for this great event. Every year, on a single day in mid-February, breweries across the state of Oregon host free tours in an open house format. Participants take short tours and receive samples given directly from the conditioning tanks. The tap near the bottom of the tank is called a "zwickel," and hence the name. This event takes in the Portland metro area on one weekend, and then in all other parts of Oregon state on the following weekend. This year, in Portland alone, 65 breweries participated. 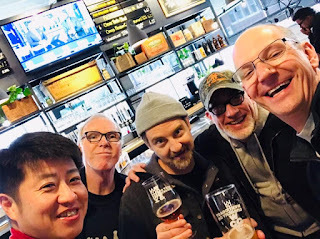 Five of us went off across the city in search of some of the newer breweries, or some in cases newer outposts of established breweries: Vagabond Brewing Portland, West Coast Grocery, Ruse Brewing, Von Ebert East, Migration Brewing - Gresham, and Threshold Brewing & Blending. Our fifth stop of the day was Migration Brewing – Gresham. To be honest, I hadn’t paid much attention to Migration Brewing for several years. I recall visiting their Glisan St. brewery during Zwickelmania in 2013, but I don’t think I have tried any of their beers since then. Well, things have changed and are continuing to change. First, the brewery has built a large new facility and plans to expand production greatly. Migration produced 1450 barrels in 2017, planned to make 3,000 barrels in 2018, and has the aim to turn out 10,000 barrels in 2020. Second, they hired Head Brewer Trever Bass away from Hopworks Urban Brewery. Third, they signed a distribution deal that should allow them to make their beers much more widely available. Fourth, they now have a large taproom area at the front of the brewing facility. Finally, the customer space will soon be augmented by an outdoor patio and an event space. Generally at Zwickelmania, we tend to drop in at a brewery, sample a few taps, chat briefly with the brewer or the staff, and then quickly move on to the next place. However, we spent a considerable amount of time at Migration. This was partly due to the quality of the beer and partly because of Trever Bass’ interesting stories and explanations. The beer ranged from a massive barrel-aged imperial Stout (“Vanilla Westward”) to an intense West Coast IPA (“Straight Outta Portland”) to a saison made with 500 lbs. of grapes (“Maltbec Nouveaux”). We had a lengthy chat with head brewer Sean Burke and admired the large foeders lining the walls of the brew area. Von Ebert offered samples of two beers: Taufe Pils and the intriguingly named Diagetic Sound, a farmhouse ale. Diagetic sound is a film studies term which refers to movie sound which is part of the story, or sound that the movie characters would hear (as opposed to, say, violins playing sad music during a sad scene). We also had a big muscular IPA, Duke of York, with lunch. The brewpub dining area gives out onto a shady leafy green golf course, and we watched weekend golfers leisurely strolling along as we ate and imbibed.